You'll be £25.00 closer to your next £10.00 credit when you purchase Air Battle for Burma. What's this? Using veterans’ first-hand accounts, Air Battle For Burma reveals the decisive nature of Allied air power in inflicting the first major defeat on the Japanese Army in the Second World War. Newly equipped Spitfire fighter squadrons made the crucial difference at the turning point battles of the Admin Box, Imphal and Kohima in 1944. Air superiority allowed Allied air forces to deploy and supply Allied ground troops on the front line and raids deep into enemy territory with relative impunity; revolutionary tactics never before attempted on such a scale. 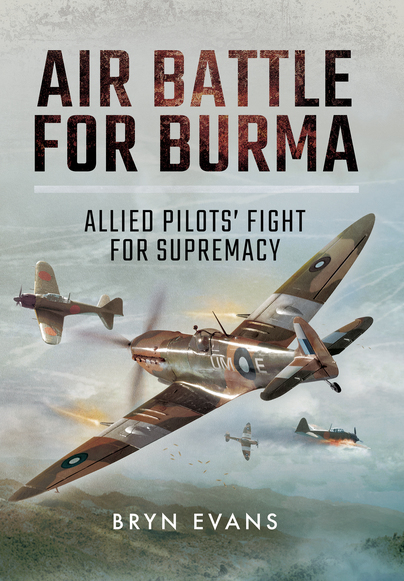 By covering both the strategic and tactical angles, through these previously unpublished personal accounts, this fine book is a fitting and overdue tribute to Allied air forces’ contribution to victory in Burma. I have just finished reading Air Battle for Burma. Excellent work. My local bookshop got the copy imported from England for me and I would like to congratulate the author on the book. As well as some clear maps and striking photographs, what makes the book really ‘come alive’ is the interweaving of the personalised stories from some of the pilots themselves. Using a mixture of diaries and personal interviews, Evans includes these dramatic descriptions of combat between Commonwealth fighter pilots and their Japanese foes. The Burma campaign has often been associated with the ‘Forgotten’ XIV Army. This is therefore an important contribution by Evans to shed some new light into this important, but somewhat under-reported and undervalued, campaign. Not only was it a riveting story, it had the ring of truth about it. I was fascinated by it, and had trouble putting it down. Your book Air Battle for Burma surpassed your excellent "The Decisive Campaigns of the Desert Air Force 1942-1945". I am ashamed to say I was not aware of the detail you supplied in your magnum opus - it was superb, well researched and vivid, written so professionally. I was exhausted in my Spitfire and I could just visualise and smell that jungle. What if I had to jump? Glad we finished that war. Col Frize, RAF fighter pilot Ret’d. Once again, congratulations on an excellent book. I believe that both Air Battle for Burma and The Decisive Campaigns of the Desert Air Force 1942-1945 are excellent books. Bob Treloar, Air Vice-Marshal RAAF Ret’d. An excellent book about the air war over Burma.